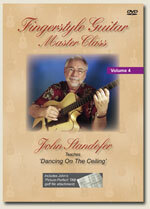 This is the fourth video in the Master Class Series from John. In volume 4, John teaches his arrangement of the classic Rogers and Hart song "Dancing on the Ceiling." The Master Class series is designed to provide high quality, affordable video guitar lessons for intermediate to advanced fingerstyle guitarists. These are not just ‘see and do’ lessons, however. Being able to play a piece well is only half of the formula for becoming an accomplished artist. The other half is learning to develop basic songs into spell binging arrangements that thrill audiences (and reveal your unique talents). This 30 minute lesson gives you insights into arranging the song for guitar, provides a blow by blow description of the arrangement itself and includes John's 'picture-perfect' TAB of the entire piece. Add this classic to your library today!